Walter Pasquarelli is a recent Politics (MPhil) graduate from Queens' College, Cambridge, and founder of machine-kind.com, a digital platform publishing research on the impact of AI on society. Walter Pasquarelli have published several articles and collaborated with various research institutes such as with Boston Consulting Group's CPI, Harvard's Future Society, and the Future of Life Institute. Social control, the mechanism for maintaining social order within communities, is as old as humanity itself. Without the necessary mechanisms for ensuring some degree of social control, communities would have been difficult to organize and maintain. Artificial intelligence (AI) is a game changer in this field, reflecting fundamental shifts in the contemporary technological and socio-political landscape. 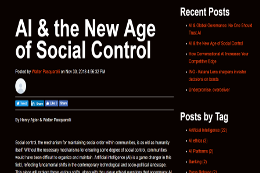 This piece will explore these various shifts, along with the unique ethical questions that accompany AI in the new age of social control.